American R&B/soul contralto vocalist (born January 25, 1938, Los Angeles, California, USA - died January 20, 2012, Riverside, California, USA), the most prominent female vocalist of the Chess label. 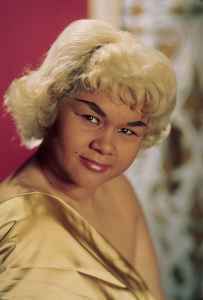 Etta James was discovered as a teenager by Johnny Otis, with her first hit in 1955. She recorded for Modern Records (2) and Kent Records for the remainder of the 1950's. She signed with Chess in 1960, recording with them until 1976. From 1965 to the mid 1970's she battled heroin addiction. In 1978 she recorded the Jerry Wexler produced "Deep in the Night", which was her final recording until 1988, returning to the Muscle Shoals Sound Studios to record "Seven Years Itch". From 1988 through 2006, she recorded frequent albums. She was inducted into the Rock And Roll Hall of Fame in 1993. In 2008, the movie "Cadillac Records" told the story of her career through to the late 1970's, with her role being played by Beyoncé Knowles, who also recorded some of James' songs for the soundtrack. For writing credits in her early career she used the last name from a couple that took care of her as a child, Jamesetta Rogers and on a rare occasion her real name Jamesetta Hawkins. Mother of Donto James and Sametto James. Just paying my respects to Etta. Vocally she was like a cross between Janis Joplin and Marva Whitney. But she had a more broad vocal range. Though i have discovered little of the music that Etta has done at this time, i did (and still do) bang "In the basement" when i play out amongst others. But i am careful to play most of her rawest tracks. She had a voice that could cut an anvil in half. It´s strange too to think that the man who discovered Etta, Johnny Otis, died just 3 days before her.